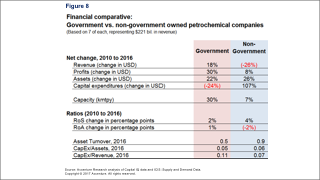 In the petrochemical market, traditional patterns of company ownership are changing. 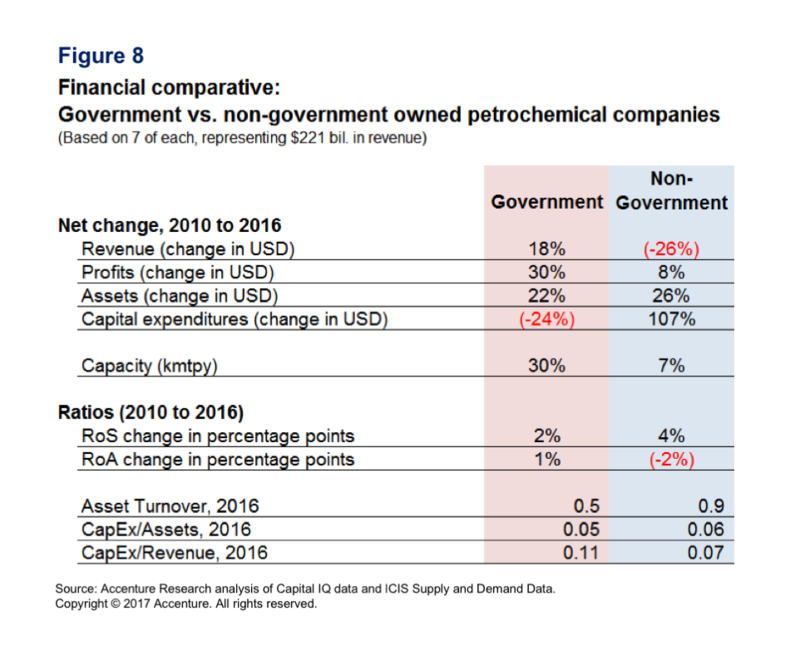 We are seeing the rise of state-owned enterprises (SOEs), especially in emerging markets, and in the ownership in the downstream petrochemicals segment. Accenture’s analysis of ICIS Supply and Demand Data shows that this shift is bringing a flood of new producers to the industry—and with it, greater levels of competition and risk, and less control over capacity for publicly listed/private companies—that is, the non-SOEs. As a result, we may well see more M&A activity. The industry is evolving, and with the growing prominence of SOEs, petrochemical companies will have to carefully select products, locations, strategies and tactics if they are to grow economic value. 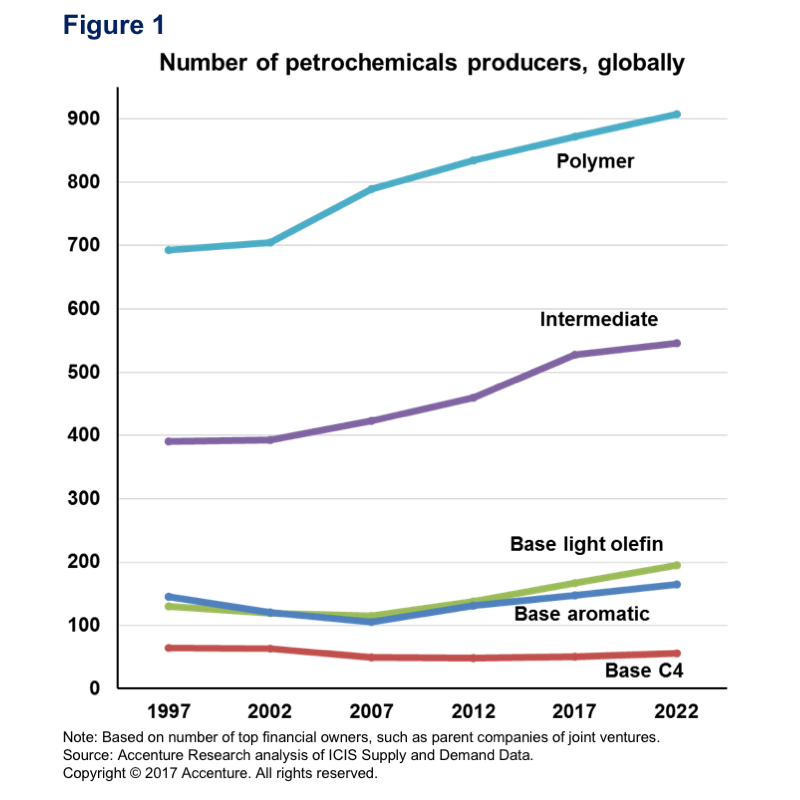 From 2007 to 2017, 212 new petrochemical producers entered the industry, an increase of 20 percent.3 In the next five years, that number will increase by at least another 51 companies, based on capacity announcements. The number of producers across most segments is expected to keep rising (Figure 1). Usually, an increasing number of players is a sign of market maturity. But the petrochemical business is not really a single market, although it is sometimes referred to that way. Instead, it encompasses hundreds of downstream derivatives, each with its own life cycle. The numbers presented here represent an aggregate, and actual maturation across those products may still be decades away. Nevertheless, the rising number of players does signify greater competition and greater customer choice. It could also point to increased consolidation-driven M&A activity going forward. As new players enter the market, the list of top players is changing as well. 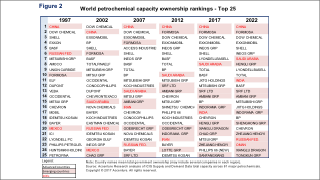 Figure 2 shows more and more new players from emerging markets (shaded in red) placing among the top 25 petrochemical producers, as measured by total capacity owned. Only four emerging-market producers were on the list in 1997. Today, there are 12, and by 2022, there are likely to be 14—a majority. This reflects increases in capacity in emerging regions to gain market access, as with China, or because of the availability of feedstocks, as in the Middle East. Also, governments4 will significantly increase their ownership role in the next few years, rising from three companies on the list in 2017 to five by 2022. Despite the shift of raw material markets to emerging economies, many advanced-economy producers are still in the top 25. That’s because they still have some key advantages, including strong technology positions, efficient operations, flexible organizations, deep knowledge of customer markets and global supply chains. Emerging players tend to license technology and operate locally. A warning to producers that are not actively investing in such advantages: Only 10 of the top players in 1997 were in the top 25 in 2017, and only nine are expected to be there by 2022. Some fell from the list due to M&A, while others dropped due to slow growth compared to emerging-market players. Even with all the new entrants, the top 20 producers will still control 58 percent of all capacity by 2022. But this is a drop from the 63 percent they held in 2002, as shown in Figure 3. 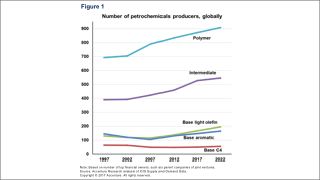 The market concentration of top players has been dropping for major categories of petrochemicals, with the notable exception of base aromatics. Aromatics are typically co-located with refineries that often are linked with oil companies, which in turn have heavy government participation in emerging markets. Olefins seem to be safer because a lot of the new capacity is related to gas-based cracking investments in the North America region. However, even there, about 20 percent of new-capacity investment is ultimately owned by SOEs, most of which are headquartered outside of North America. Looking beyond 2022, SOE participation in North America may increase even further. Already, about a quarter of world light olefins capacity and a third of world aromatics capacity is government-owned. This is driven by the rise of emerging markets, which tend to have petrochemical SOEs. Aggregate SOE ownership of capacity ownership is expected to rise from 23 percent to 25 percent in just the next five years (Figure 4). Meanwhile, the top eight public oil companies,5 even though they are expanding, will lose share in petrochemicals by 2022. Back integration into raw materials is therefore not necessarily critical to participation. Market share may increase after 2022, however, as low oil prices prompt the companies to position capital into more profitable areas of their portfolios—such as gas-based chemicals in North America or other regions (see past blog). SOEs are also investing in downstream operations, harnessing the added value in those products. 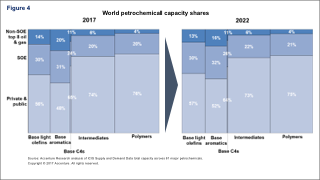 Thus, their ownership shares are expected to rise one to two points for intermediates and polymers over the next five years. 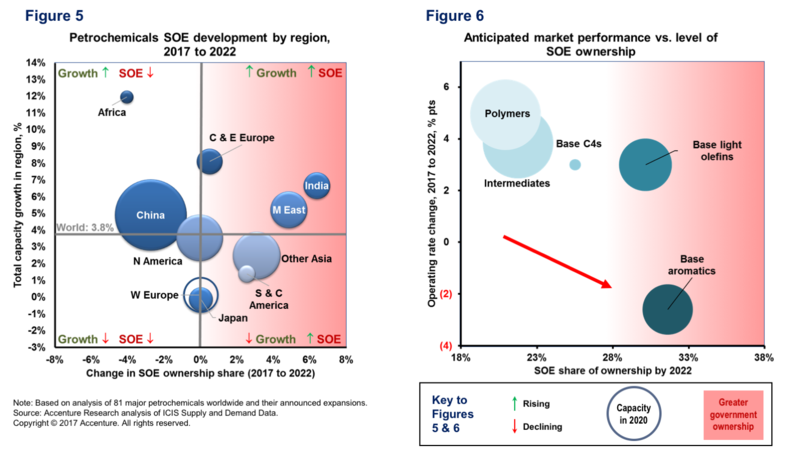 As SOEs expand their downstream control, producers should cautiously assess how markets in intermediates and polymers may be affected in the next few years. For example, products such as PVC can often be subject to non-demand-based decisions that result in oversupply in the market, thereby reducing future margins. Overall, SOE ownership of assets may mean an uneven playing field for other producers because the SOEs can pick the best locations for their assets, bar others from participating in their regions, obtain preferential lending terms, receive better feedstock supply terms, enjoy easier permitting and recruit better local talent, among things. The regions that are likely to see the greatest petrochemicals capacity growth correspond to the areas where SOE ownership is common, such as the Middle East, central and eastern Europe, and India (Figure 5). China’s share of SOE ownership, although very large, is projected to decline. Interestingly, Africa has both high growth and a declining share of SOE ownership, although volume is still relatively low. This area may represent good prospects for future growth as demand rises. SOEs often build capacity for reasons other than marketplace supply and demand, such as increased self-sufficiency, hydrocarbon exploitation, employment or tax revenues. Thus, there tend to be poor industry operating-rate outlooks for products that have greater SOE involvement (Figure 6). Operating rates correlate strongly with margins. It’s also important to think about where capacity is being built. A lot of capacity is being created in regions with very poor “doing business” scores, as defined by the World Bank’s6 ranking of economies. 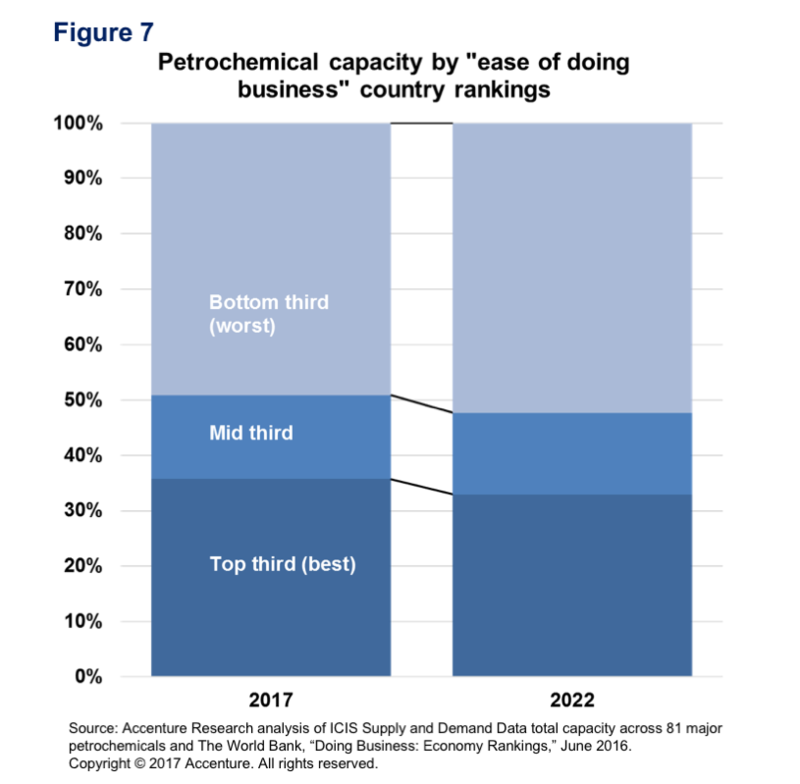 By 2022, 52 percent of capacity will be in the lower third ranking of countries producing chemicals, up from 49 percent today (Figure 7). The list includes many emerging countries in the Middle East, Asia and Latin America. This, combined with the power of SOEs in those countries, will make it critical for non-SOE companies to be as locally connected, lean and innovative as possible to have an advantage in the global market. Figure 8 shows financial metrics for SOEs versus non-SOEs. Return on sales (ROS) improved 2 points more for non-SOEs than for SOEs between 2010 and 2016. SOE revenue growth has been stronger, but that has been mainly from volume growth as capacity for SOEs increased by 30 percent between 2010 and 2016, versus only 7 percent for non-SOEs. While capital spending rose more for non-SOEs, that is probably due to a combination of asset maintenance, modernization and expansion, versus SOE spending, which has been mainly for expansion. Asset turnover figures support that view, as they are lower for SOEs, indicating poor asset management. Lack of spending on existing assets can undermine a company’s ability to operate effectively in the longer term. The SOE focus on capacity expansion contributes to oversupply, brings down margins and causes shutdowns of non-SOEs in the process. The benefit to producers, but not customers⁄citizens, may be that the high-cost capacity could keep prices high during up cycles⁄periods of recovery. 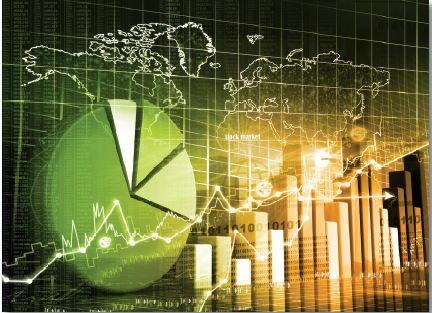 As the overall market subtly matures and becomes saturated, it will be more difficult for companies to maintain or improve profits, especially with an uneven playing field in growth markets. 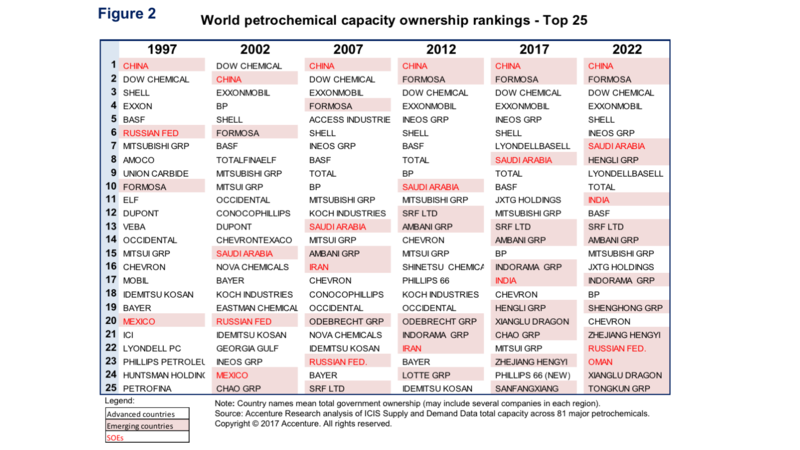 Changing ownership and rising competition in petrochemicals bring greater risks for non-SOEs, especially when competing in SOE markets or in markets where SOEs may add unneeded capacity. Carefully assess business plans for risks of capacity overexpansion, identifying which plants⁄competitors will be at risk for shutdown. Align with affected customers and identify supply schemes early. Constantly innovate in plant and supply chain efficiencies to stay on the low end of the cost curve—perhaps even radical new approaches. For instance, the huge new export volumes from North America may be an opportunity for innovation, taking lessons from established dry bulk commodities. Tap into the advancing digital technologies, including the Internet of Things, to increase reliability, flexibility and selling propositions (see Accenture’s Chemical Industry Vision). Innovate across the board in processes and products. Selectively partner with well-managed SOEs intending to expand in and out of their regions, as they will need expertise and technology from experienced global players. Prowl for acquisition targets that can be strengthened by the company’s assets, technologies, alliances, supply chains, site⁄near-site integration, etc. Search for locations (i.e., countries or special economic zones) that have lower risk and⁄or better “doing business” environments, while still being near demand or feedstock centers. 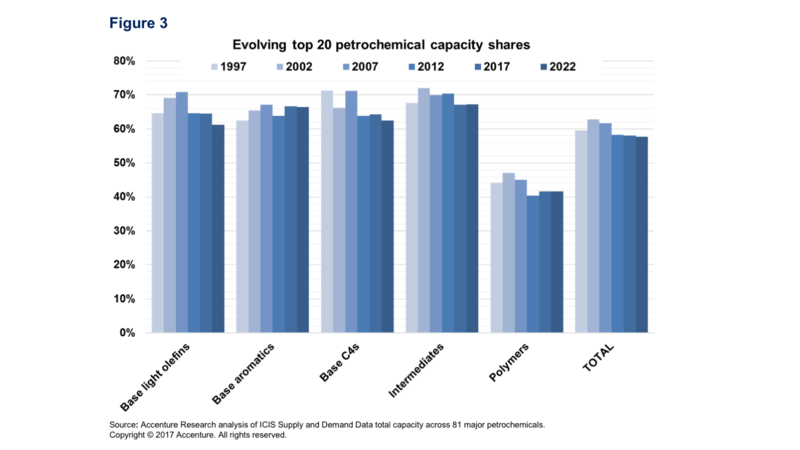 With increasing competition on the way, petrochemical companies that cannot innovate and improve around any of the strategic considerations listed above are likely to struggle—and, perhaps, find themselves assessing a divestment or merger as a way out. 1. Product life cycle theory holds that product markets move through the stages of introductory, growth, maturity and decline. 2. Based on the econometric analysis of historic world ethylene, propylene, benzene, toluene and xylenes demand, from the ICIS Supply and Demand Data Service, and world GDP growth. 3. Based on top level financial owners; Accenture Research analysis of ICIS Supply and Demand Data Service. 4. Based on total share of capacity owned. For instance, there could by several SOEs under one government. 5. Our top eight includes ExxonMobil, Shell, BP, Total, Valero Energy, Chevron, Marathon and JXTG. 6. 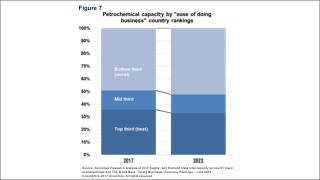 The World Bank, “Doing Business: Economy Rankings,” June 2016, http://www.doingbusiness.org/rankings (accessed August 1, 2017). 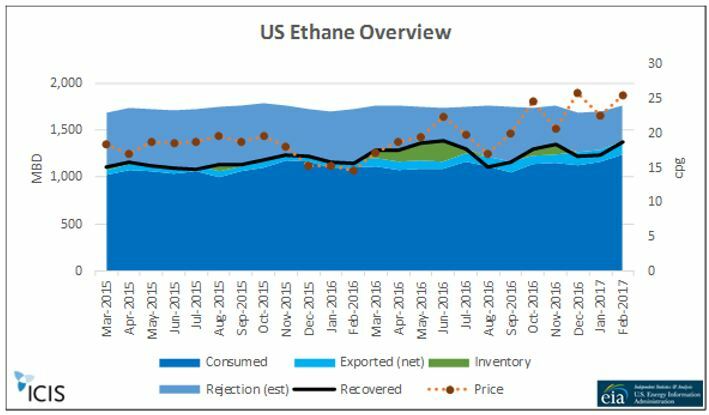 PREVIOUS POST Is The US Ethane Market Getting Tighter?